Congrats on your finish, toverly. Love the pillow you made from your extras. Congratulations toverly... Those straight borders were hard to do. Good job! Thanks JENNR8R. Oh, if you could only see those borders up close. I don't think I have ever made a quilt with as many little "tucks" in the edge. But, as you can see, it doesn't show up to anyone but me. And it did get rid of the waves. toverly: Congratulations on your wonderful finish! I didn't think of making it 5 by 8 blocks to get it rectangular. I sewed the first border on and then added a solid green strip. I made the next two borders as long pieces of fabric rather than using the individual blocks. I sewed them together and hope to get them on tomorrow so I can drop it off at church on Tuesday for the quilting group to finish. I made my top and bottom borders wider so I could get it as a rectangle and to the appropriate size for the church ladies. Congratulations toverly! Your quilt is beautiful! My top is finished and ready to donate to my church group to sandwich, tie, sew down the binding from the back, and donate. It is 71” by 77”. I chose not to use the final 3 borders so I could make it rectangular and have it within the parameters of my church’s measurements. 2 more days of sewing since school has been cancelled through Wednesday. -28 actual temps with wind chills between -40 and -60. I loved having those ‘surprise’ days when I was teaching but I think I like them even more as a substitute teacher. . I just am sad for the children that may only get a good meal at school but safety from the winter elements comes first. Congrats on getting your top done, retiredteacher. 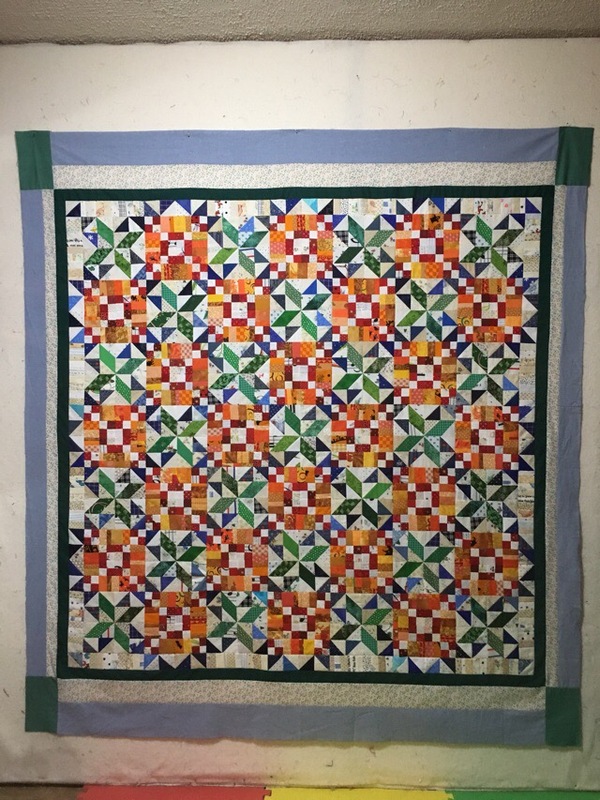 Love the soft blue and the solid borders around the quilt, retiredteacher. Looks great. It really calms this quilt down. Good job. Well done, retiredteacher! I think your quilt has the look of an impressionist painting. I have finished putting all the spinning star blocks together and I'm almost done with the orange string blocks, so here is what it looks like on my design floor. Connie, it looks lovely. I like the idea of no-seams borders for the outside edge of the quilt. It seems more stable to me. I live in Woodbury, so I know what you are talking about with the weather! Sync, yours is looking great. The colors you used have a real depth and richness. Snyc: You are making great progress! So pretty! Audsgirl: We are 'neighbors' then! I finished my flimsy a few days ago in Bonnie’s colors. I like it but have to admit it doesn’t look like mine........it’s so very bright! 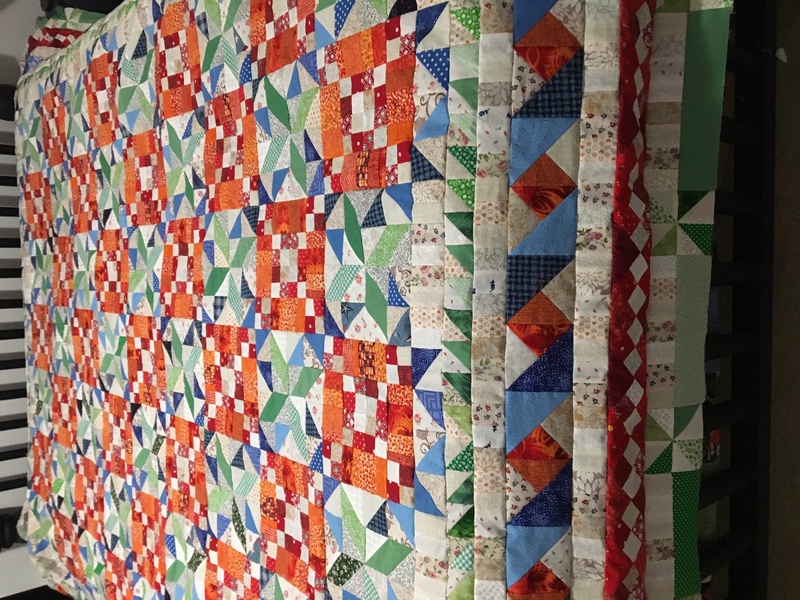 My husband was sort of speechless when he looked at the finished quilt......thought a couple of minutes and said he likes it better when I pick my own colors. I ended up putting it away for now. At the moment I don’t have a home for it and it takes up less space in flimsy form! I learned so much making it and have already used her Bonus Buddy technique to design and finish rather quickly a table quilt that everyone in that family is enjoying! Looking good Sync. 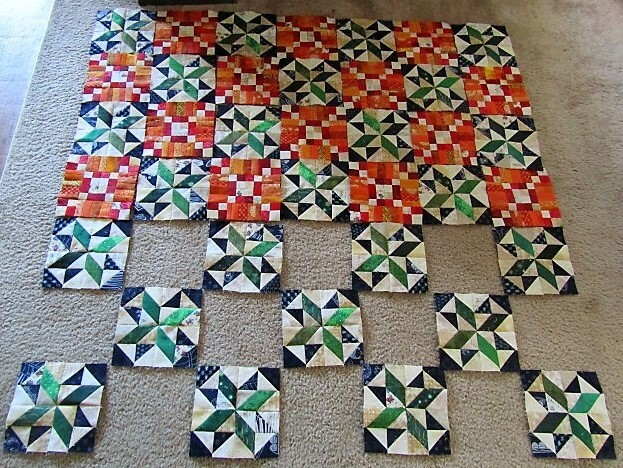 I'm with audsgirl, if I did it again, I would not have the 4 pieced borders. That's where the trouble came in. The green sawtooth one is where I think mine went wrong. Thanks everyone for the comments. I should finish the orange string blocks today and maybe start putting the rows together, we'll see how the day goes. One thing I learned in adding these borders was to edge stitch the white string border before attaching it. Then when you are pulling it while adding the next border, the pieces don’t come apart. I’m working on border number 6. Then I’ll decide if it is big enough or if it needs a #7. Hope to have a finished pic soon. Feathers-n-Fur: That's a good tip to staystitch. I should have done that with my orange strip units. Sync, your quilt is conning along really well. Feathers-n-fur, thank-you for a great tip. I’m thinking of making some fabric change. I’m not impressed with my brown fabric. I’m thinking of switching it out to a purple and blue batik fabric. I’ll make a block and decide. I have the pieces for the sized Bonnie created, just starting to put together and still making the extra block pieces. Back to the fun. Feather n fur- Thank you for the tip. I just started piecing a second set of those borders and the stay stitch saved my sanity! 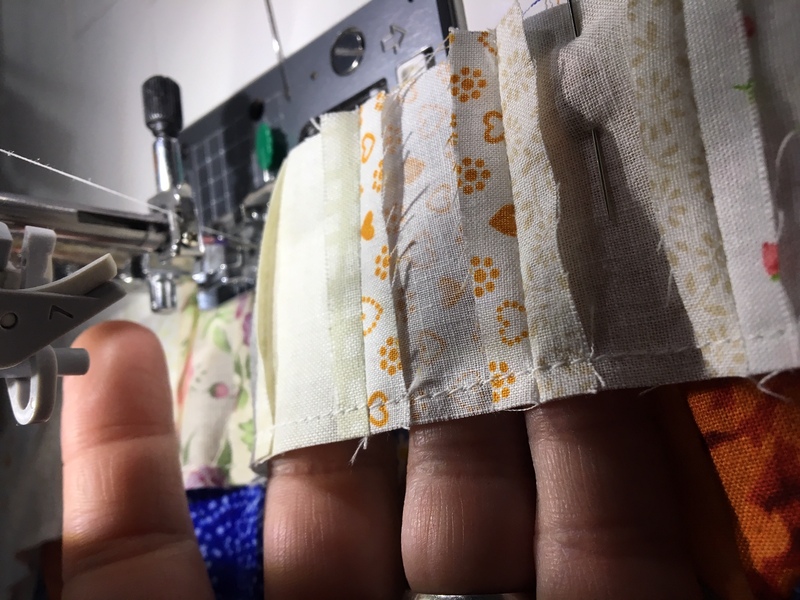 I finished the last two blocks yesterday and thought I'd decided on a final setting, had the rows pinned for sewing...had another thought in the night I'll be unpinning them later today. My working wall is a gift to my imagination but there are So Many ideas! I edge-stitched those, too. I used a really small stitch and did the edge-stitching before I removed the paper, so it kept the strips from stretching, but the very small stitches didn't make the paper removal difficult. I have finished my orange blocks and am halfway through constructing the star half blocks. I have all of my blue 1/2 squares cut out and sewn, need to square then and iron. My purple blocks just need to iron the small pieces and sew together. I’mliking My fabric change. Need to make 4 more stripes of the small tourques 1/2 sqs and the 3 piece blocks needs extra blocks. Have not figured out how many. I’m making progress. My goal to have the top together by 2 weeks. I’m really going to like my changes and this quilt. My game plan to get up early and sew for a few hours. Retiredteacher, i I like your quilt. Nice choices in fabrics. I’m enjoying seeing all the lovely finishes. I finally finished my top last night. I did a 7x9 layout, but it wasn’t big enough so I added the red border with the extra 4 patches. It still wasn’t big enough, so I added the green border using the extra free HSTs. I’m fairly happy with it. I’m going to make a pieced back, so quilting will have to wait a bit.